It's bonfire night in the UK and while I may not be letting off fireworks myself, I thought it only appropriate to pick up some glitter nail polish for the occasion. Today's nail polish is Barry M's Gold Mine. 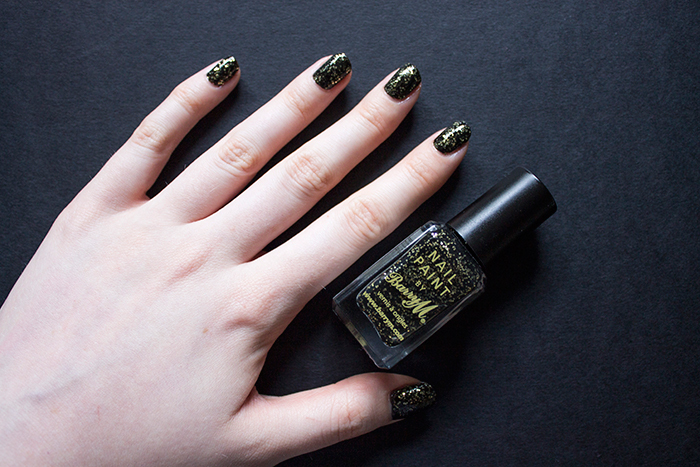 Gold Mine is a gold glitter with a black polish base coat. It's one of my pet peeves that most glitter polishes are often clear so this one has a fuss free application. The black polish base coat is slightly on the thinner side compared to regular polishes on first application but turns opaque after the second. The glitter itself is on the chunky side but small enough to lay flat on the nails for easy application. As for the longevity of the polish, it's good for a few days wear but sadly does begin to chip around the edges soon after. This is possibly due to the glitter so I find it best to pop on a clear top coat to extend the wear time. Overall, a good value for money, fuss free glitter polish that would be perfect for your upcoming Christmas nights out.